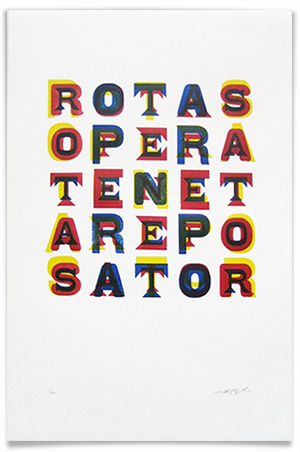 The Sator Square is a word square containing a Latin palindrome featuring the words SATOR AREPO TENET OPERA ROTAS written in a square so that they may be read top-to-bottom, bottom-to-top, left-to-right, and right-to-left. The earliest known appearance of the square was found in the ruins of Pompeii which was buried in the ash of Mt. Vesuvius in 79 AD. 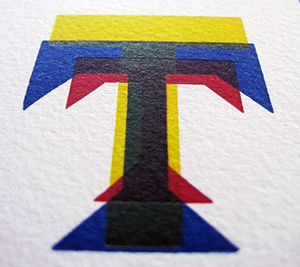 Printed at the Western New York Book Arts Center, with 3 different type styles in 5 different vintage wood type blocks. 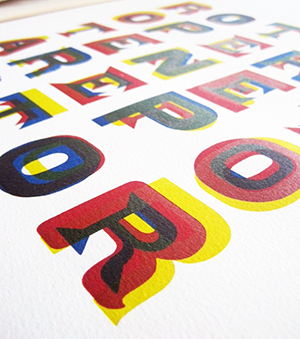 This 3 color letterpress poster was designed and printed by Richard Kegler in a signed and numbered edition of 40 copies, on 15" x 22" Arches paper with deckle on 3 sides.